I listened to Amy Chua read her book Battle Hymn of the Tiger Mother on a recent road trip. It left me with a headache and a lot to think about. I’m sure that more people know the book from the essay/excerpt Why Chinese Mothers Are Superior, published in the Wall Street Journal. Both sides of my reaction to the book are visible in that excerpt, although it’s only in the full book that I can see how they play out in interaction with each other. Chua’s book contrasts two styles of parenting: the one she calls Chinese and the one she calls Western. Early on, she describes the “virtuous circle” that is the goal of Chinese parenting. The virtuous circle recognizes that the hardest part of any activity is the beginning – learning how to do it – and that, left to themselves, children will drop out of an activity when it is difficult. The parent’s role, according to Chua, is to require the child continue in an activity even when they are not yet successful, having a terrible time, and demand to quit. The tactics used to get the kids to continue include bribes, naming their failure along with the possibility of doing better, and battles of temper and will. The book is aptly named. When the children succeed – which they usually do – they receive praise and win competitions – something Asian children are known for. They also have a strengthened sense of self-efficacy and self-esteem. Even though they wanted to quit, they have learned that they DO have the ability to succeed. This produces self-confidence to tackle even more difficult tasks, and awareness that hard work – lots of it – can lead to mastery. Chua contrasts this Chinese approach, with its heavy emphasis on achievement, with the Western parenting style, which emphasizes the child’s self-esteem (seen as fragile) and their tender psyches. Instead of the virtuous circle, many Western parents (and also school systems) read the correlation between self-esteem and achievement in the opposite direction: that people who have high self-esteem are more likely to succeed, so the fastest path to success is to build children’s self-esteem. This philosophy runs into two brick walls. The first is its notable lack of success. Since this approach was instituted, American high school students fall near the bottom in math ability. In spite of providing universal access to a high school diploma for free, we still have 8 percent of students failing to finish high school. Students facing more demanding curricula and test-based diplomas (even in Western nations) do better. The rampant mental health problems of America’s teens and young adults is the second indicator that this approach doesn’t work. Young people DO develop tremendous self-esteem, a sense that they are good and valuable. But it’s fragile, not based on any specific skills that they can point to. In fact, relieved of the need to solve most problems, they are actually less able to figure out a solution to a problem than similar students 40 years ago. As young adults, their belief that they are good and competent repeatedly encounters their inability to carry out basic tasks; they are emotionally unprepared for handling stress and failure. Self-esteem crumbles when no real-world skills or achievements back it up. Yes but … how do we get to achievement first? I’ve long been aware of the virtuous circle, although I never considered it to have a particular ethnicity. Benjamin Franklin, Andrew Carnegie, and Horatio Alger certainly understood the dynamic of undertaking hard and unpleasant tasks in order to reach success. In fact, America’s reputation as a land of opportunity rests on the virtuous circle: hard and diligent work, even at menial or difficult tasks, can lead to ultimate success. But readers of Amy Chua’s book or essay are struck with the means. There is a refreshing directness in simply saying that a musical piece isn’t good enough or that someone needs to lose weight. At the same time, the harshness of calling someone “fatty” or even “garbage” while expecting them to know that they are loved is not easy to understand or accept. Franklin and Carnegie persevered without such epithets. Are they the only way to bring about the virtuous circle? Chua’s identification that self-esteem and confidence are based on succeeding at increasingly difficult tasks – and not the other way around – is right on target. Her claim that children won’t work through those difficulties on their own is accurate, and the position that parents have a responsibility to make sure their children tackle the difficulties and learn to persevere and succeed is easily defended. Most college students who struggle with academic failure or emotional distress are those who lack skills to deal with stress and potential failure. I stand with Amy Chua on this point. But I cannot stand with her, and must stand with her critics, regarding the methods used to motivate her children. Even the letter Why I Love My Strict Chinese Mom, written by her oldest daughter, only supports the importance of parental involvement and demands so that their children develop the skills they will need – it praises strictness, not the demeaning and ridiculing words. It does not support the extreme intrusiveness. 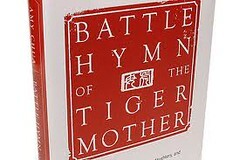 Is the Battle Hymn of the Tiger Mother worth reading? The book is entertaining, and to some extent a mind-blowing window into the family life that produces those amazingly successful children we see on TV or as class valedictorians. It is a tremendous antidote to the over-gentle approach to parenting. I suspect Chua made her character out to be more villainous than necessary – whether to sell books or simply for dramatic effect. The book is well worth reading. If you have the chance to listen to the audio book, it is even more worthwhile to hear Chua’s story with her own intonation and inflection. While I agree that Amy Chua could have done without the threats and name calling, I also feel that love from both the parents compensated for that flaw in Chua’s character. Have you read Sophia’s Blog “new tiger in town” or what has appeared in the “China Daily” about Tiger Mothers and Amy Chua? After reading what the “China Daily” had to say, it was obvious that this sort of behavior from a Chinese mother is not uncommon and may be considered cultural to some extent. If you are interested to see what the “China Daily” says on this topic, here are the links I’m talking about. Amy Chua wrote this two-part piece for the China Daily in early June. Amy Chua writes for the China Daily, “I was raised by extremely strict – but also extremely loving – Chinese parents, who arrived in the United States in 1960 as poor graduate students. My parents were very tough with my three sisters and me. “Today, however, I adore my parents and feel utterly grateful to them. I realize how much they always believed in me and how much they sacrificed for me. They gave me extraordinary opportunities – I went to Harvard, and I love my job as a Yale law professor – and made me proud of Chinese culture and and values. The China Daily says, “The strict parenting style advocated by Amy Chua, the Yale law professor, in her latest book, Battle Hymn of the Tiger Mother, is still popular in the country today, according to a recent survey. I suspect that the name calling and threats that loom so large in the book may have been occasional outbursts that appear larger than they were in real life. In fact, it is an author’s job to add drama to a story or else face the risk of selling few copies while the book dies a quick death and nothing works better than a bit of “dramatic effect” to boost word of mouth. Then again, this was Chua’s memoir and that may be how she remembers those years.